Seven Ways to Open Your Heart | What about this? Valentine’s Day is all about love and hearts. 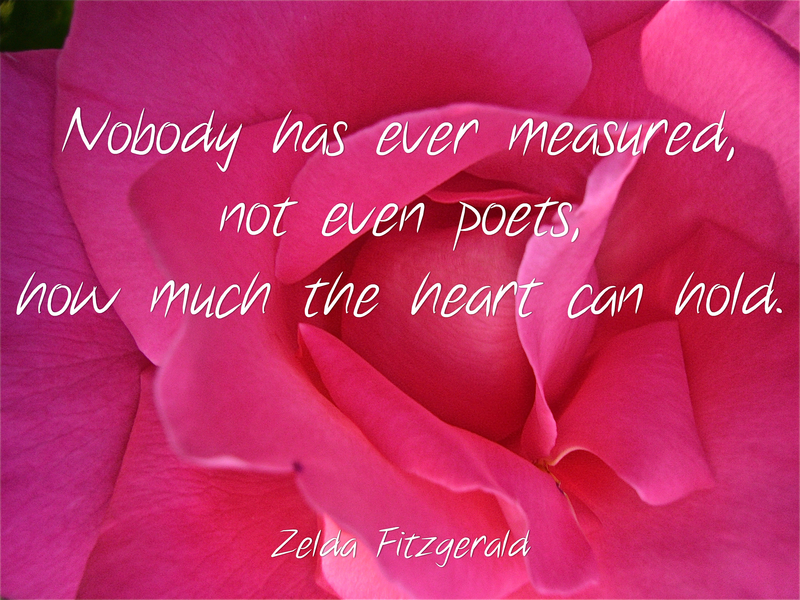 Reflecting on Zelda Fitzgerald’s quote, if there is no way to measure how much a heart can hold, do you really think you’re as happy as you can be and that life just couldn’t possibly get any better? With no degree in psychology or certificate in counseling, I offer you ways to open your heart, so it can receive more. If you don’t love yourself, how can you fully love others? I’m referring to love, not in a narcissistic way, but in a respecting, accepting, and valuing way. Buddha once wrote, “You can search throughout the entire universe for someone who is more deserving of your love and affection than you are yourself, and that person is not to be found anywhere. You, yourself, as much as anybody in the entire universe deserve your love and affection.” Think about it, if you don’t love yourself, are you capable of loving or valuing someone else? When you share your dreams with others, you open up a conversation about the “whats” and “whys” in your life. After sharing, your dreams may have an increased clarity and focus. Think of this sharing as a brainstorming session. The universe is listening and the “hows” of your life will surely fall in place. Plant your garden of dreams, tend to it carefully with the help of others and watch how it grows. At the root of the difficulty in learning to forgive someone is mistaking the action of a person for their being, and not seeing that the two are separate. Actions that people take are often wrong, misguided, or harmful to others, and these must be opposed or limited to the extent that is needed to protect the welfare and well-being of others. But souls are composed of much more than their current actions, whether good or bad, even if these actions have gone on for a long time, and even if they are very severe. Souls need to be judged on different grounds altogether. In order to judge a soul we must know that soul – something that in the most basic sense is not in the human province to do. We must be able to see the causes and reasons – the formative influences that permit a soul to carry out actions that are wrong. . . .
To stand in judgment of others, whether these others be individuals, groups, nations, or the world, implies a willingness to stand in the present while asking the past to justify itself. To forgive others, on the other hand, implies a willingness to stand in the future in viewing the past, while asking what possible future could redeem the past, changing its present course and bringing it more into alignment with what is right and good. This is the place on which love stands, for love has hope for all possible futures for individual persons and for the world as a whole. Love does not rely on the present context of viewing mistakes, no matter what these mistakes are. It says: How can I bring the beloved one into a deeper knowing of the light that lies within them so that past darkness can be no more? There is probably no better way to open your heart than by helping others. When you help others, you help yourself. Studies have shown that those who help others are happier and less depressed than those who don’t. Stephen Post, PhD and co-author of the book, Why Good Things Happen to Good People wrote, “When you’re experiencing compassion, benevolence, and kindness, they push aside the negative emotions. One of the best ways to overcome stress is to do something to help someone else.” So when you’re feeling down and out, volunteer at a senior center, give money to a homeless person, adopt a pet from a shelter, etc. You’ll not only feel better, you’ll test just how much your heart can hold and perhaps, start in motion, a chain of opened hearts. Open your heart to the words of others. People talk to you all day long and you probably selectively choose who and what you want to listen to. Listening is a skill and to be a good listener you’ve got to go beyond the words being spoken. Put yourself in the speaker’s shoes and try not to judge what is being said. Don’t formulate a response in your head and don’t agree or disagree. Merely give the person the gift of your undivided attention and the validation he needs. Allow yourself the freedom to be yourself or be true to yourself. How can you possess an open heart, if you are not living an authentic life? If you feel the need to continually censor what you do or say, you are either not comfortable with who you are or who you are with. To speak your truth should not be confused with permission to be disrespectful or rude to others, but it is to live a life free of any disguises or acts. Live your life with joy. Go outdoors and soak in the large and small wonders of nature. Use all of your senses – see, touch, taste, smell, and hear the world around you. Listen to music. Play a musical instrument. Sing. Dance. Run. Create something, anything. Laugh out loud. Smile from ear to ear. Feel deeply. Share. Open your heart. Love. Note: Inspirational photo made using one of my photos and iPiccy.